Home » bamboo » fastest » grass » nature » tallest » Bamboo is the tallest and fastest growing grass on Earth! 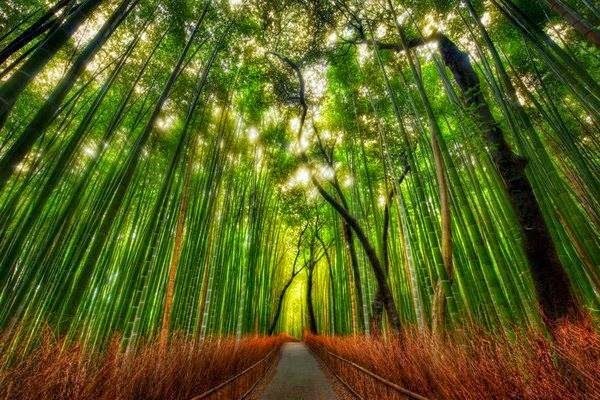 Bamboo is the tallest and fastest growing grass on Earth! Bamboo is one of the most valued and versatile plants on Earth. Although most Americans recognize it mainly as the sole food for giant pandas, bamboo has been prized for centuries in Asia where it is used for food, construction, arts, music, cooking and in gardens. American gardeners have relied on this giant grass chiefly for stakes to support plants. But increasingly, they recognize bamboo’s usefulness in the landscape to provide privacy, screening out undesirable views of neighbors, especially in crowded urban environments. Believe it or not, bamboo is a member of the grass family. There are more than 1,200 known species and varieties growing native on all continents except Europe and Antarctica. They range in height from a few inches to 60 feet; some are tall and erect, while others fan out like umbrellas. They can grow as perennial ground covers, shrubs, vining climbers, fernlike tropical plants and soaring timber bamboo. Ground cover types can be sheared and used as lawn substitute. Regardless of size or usage, all bamboos share a similar characteristic — they grow tall very quickly. Unlike trees, which take years to mature, bamboo plants send out stalks, called “culms,” which are usually hollow, jointed stems, that reach mature size in just one year. Bamboos are further defined as clumping or running. Some tropical bamboos grow in slowly spreading clumps, while others spread rapidly by sending out running rhizomes that can emerge up to 20 feet from the mother plant. Because of the invasive nature of these running forms of bamboo, many gardeners have shunned this beautiful, versatile plant. But with a few precautions, shapely and colorful bamboo can provide privacy, filtered shade, graceful movement and scintillating sounds, both of rustling leaves or culms tapping against one another in the wind. Bamboo is the world's tallest, fastest-growing grass. It propagates primarily by spreading rhizomes and forms clumps or patches of bamboo in which the center plants are the oldest and the outer plants are the youngest. Some species are restricted to tropical areas, but others do very well in Northern temperate climates. The rhizomes of bamboo are classified as two types: clumping and spreading. Bamboo with spreading rhizomes do best in temperate zones and some species are hardy as far north as U.S. Department of Agriculture zone 4. Species with clumping rhizomes are better off in tropical or subtropical climates or USDA zones 9 through 11. Northern growers in USDA zones 4, 5 and 6 have to lower their expectations for growth and site the plants in locations protected from prevailing winds. In sub-zero temperatures, plants may lose their leaves and die back to the ground. However, the plants will recover in the spring with warmer temperatures and begin growing again. Growers in warmer zones can expect normal or near-normal growth rates and plants that don't die back to the ground, providing suitable species are planted.